The Silver Stamper: CELEBRATION THEME, The Paper Players Challenge #400! 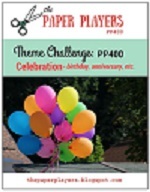 CELEBRATION THEME, The Paper Players Challenge #400! My submission for The Paper Players Challenge (thepaperplayers.blogspot.com). This Challenge is #400 so, of course, the theme is "a celebration"! I thought I would do something a little different. Not just a PP or birthday, wedding celebration, but celebrating all of those hopeful young folks who will soon be heading off to college! Hope you like it!